U.S. Military Veterans of Columbia University (MilVets). Join the MilVets student group to connect with a community of student veterans at Columbia University to access club resources, career opportunities, and social support! American Corporate Partners: ACP will connect you with a mentor and networking opportunities to meet business professionals from a variety of industries @ACPUSA. FourBlock: Connect with other student-veterans and develop networking skills. This career readiness program for Post 9/11 veterans equips you with tools to build connections to open paths to the best careers possible for you. @FourBlock. GS Veterans Initiative: Dean David Keefe serves as a central resource to veterans at the School of General Studies. Contact Dean Keefe for support, referral and guidance as you navigate Columbia! Columbia University Center for Veteran Transition and Integration: Tools and programming to facilitate your academic and professional development as you transition from active service to college and the workforce. Led by Michael Abrams, founder of FourBlock. Follow @Columbia_CVTI on Twitter. Columbia University Military and Veterans Affairs: Visit the website or office for information about Veterans’ benefits and resources. GS students can contactTessie Scroggins in the GS Office of Educational Financing or consult the GS Financial Aid Veterans Benefits webpage for more information. Graduate students should consult with the Columbia University Student Financial Services office for more information. Counseling and Psychological Services: Dedicated to fostering personal wellness and development among student veterans and military personnel, CPS professionals offer individual & couples counseling, student life support groups, drop-in hours, medication consultations, and crisis intervention. Read about their Veterans Concerns team. Visit at Alfred Lerner Hall, 8th Floor; (212) 854-2878. Disability Services at Columbia University: Disability Services facilitates equal access for students with disabilities by coordinating accommodations and cultivating a campus culture that is sensitive and responsive to the needs of students. Register early with the office to access support services, assistive technology, and resources. Drop-in hours are available in Wien Hall. Resilience Center for Veterans and Families: Clinicians trained at the Resilience Center provide psychological services tailored to be relevant to and understanding of experiences unique to veterans and their family members. The VITAL Initiative focuses on maximizing veterans’ success in the academic setting. VITAL offers tutoring, work-study opportunities, individual counseling, and assistance with integration to VA healthcare and beyond. Center for Career Education: We’ll guide you to identify qualities and skills from your military work experience that will appeal to employers. Come in and see how we can support you. Sample Columbia student veteran’s resume: View a sample resume from a Columbia student veteran, Brendan Weaver, on page 24 of CCE’s Career Planning Guidebook. O Net Online: Identify keywords to help you write eﬀective bullet statements. Enter your Military Occupation Code into Crosswalk Search to translate your military assignment into a civilian occupation. Real Warriors: Step-by-step information on how to create a civilian resume. Veterans Employment Center: Use tools from the Department of Veterans Aﬀairs to learn about job titles and qualifications, translate military skills, and start to build your resume. 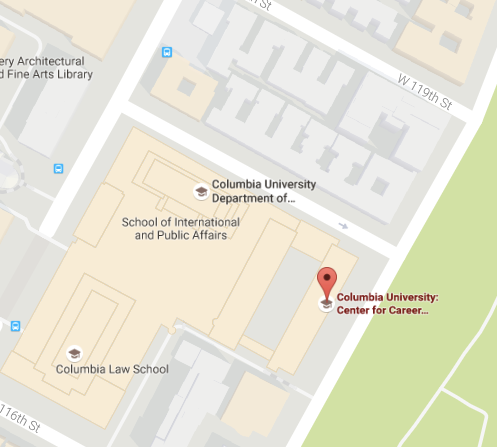 In addition to Disability Services at Columbia University, check out these national organizations to connect with opportunities, resources, and information. Lime Connect: Prepare for and connect to scholarships, internships, and full-time careers. Lime Connect works with corporate partners to rebrand disability through achievement @LimeConnect. Warriors to Work: Match your skills and experience to the needs of hiring managers through this career support program of the Wounded Warrior Project. LionSHARE: Our online database is available exclusively to students and alumni served by the Center for Career Education (CCE). Fill out your profile and career interests to see relevant opportunities. Sign up for career fairs and other events to meet employers & alumni, develop skills or explore interests. Find out when employers will be on-campus for information sessions, industry showcases, career fairs or on-campus interviews. Read about specific organizations in the company directory. Search internship and job postings. Career One Stop Veteran and Military Transition Center: One-stop website for employment, training and ﬁnancial help. Use the Military-to-Civilian Job Search tool to ﬁnd jobs based on skills and experiences you gained in the military. Hire Heroes USA: Job postings and resoources to empower veterans to succeed in the civilian workforce. Partner organizations offer free training opportunities or scholarships for training programs. Military-Civilian Career Coaching Connection (MC4): Private LinkedIn group for 1-on-1 coaching and mentoring on transition to civilian life and careers. Mynextmove.org: Investigate career possibilities and identify job titles. Explore with keywords, browse industries, or search by military classiﬁcation code. You will also gain early access to the career fair. Please sign up in advance. Contact gsvets@columbia.edu for information. In addition to the resources listed below, many organizations have Veterans hiring initiatives. Search employer websites for “veteran” or check their diversity pages. 100,000 Jobs Mission: Explore this coalition of companies from a wide range of industries, committed to hire veterans. Hire Veterans: Connecting U.S. Military Veterans with civilian careers. Military Friendly: List of the top 100 veteran-friendly employers, compiled by Victory Media and updated annually. The Value of a Veteran: Connect with employers who value and support military service @ValueOfaVeteran. Virtual Career Fair: Provides real-time access to industry leading employers through virtual career fairs. The Veterans Writing Project: Provides no-cost writing seminars and workshops for veterans, service members, and military family members. So what’s your story? O-Dark-Thirty is the literary journal of the Veterans Writing Project @VeteransWriting. Team Rubicon: Provides our veterans with three things they lose after leaving the military: a purpose, gained through disaster relief; community, built by serving with others; and self-worth, from recognizing the impact one individual can make. Connect on Facebook and Twitter @TeamRubicon. The Mission Continues: Offers the opportunity for veterans and civilians to give back to their community in a collective effort, through one day projects or a long-term action-oriented service programs. Join one of the three platoons in New York @missioncontinue. Out of Uniform: Your Guide to a Successful Military-to-Civilian Career Transition. Wolfe, Tom. Washington, D.C.: Potomac, 2012. Shares tools and tactics designed to help to find a civilian job and career. User-friendly guide to career transition, job hunting and interviewing. Business Networking for Veterans: A Guidebook for a Successful Military Transition into the Civilian Workforce. Abrams, Michael; Faulkner, Michael Lawrence; Nierenberg, Andrea. Upper Saddle River, NJ: Pearson Education, 2014. “How to” guide to enhance networking and relationship building skills to find meaningful employment in the civilian world. The author is a Marine Corps Veteran and one of the founding partners of Four Block.